George Graham Reviews Kellylee Evans' "Fight or Flight?" Kellylee Evans: Fight or Flight? The commercal success of female jazz-based vocalists like Diana Krall, and jazz influenced singers like Norah Jones has unleased a torrent of CD releases by such artists. It seems that there are at least as many jazz releases by women singers as instrumental recordings in a mainly instrumental art-form. While many such releases cover the same musical ground as jazz singers of the past, there are some interesting and creative recordings being released by artists who break out of the standard jazz singer form. Cassandra Wilson, a long-time mainstream jazz singer, and Lizz Wright who approached the genre from a more pop direction are two examples of artists who have made distinctive recordings by borrowing elements from rock, folk, and blues, as well as jazz. The latest example of a similarly eclectic and engaging recording is the debut by a Canadian singer and songwriter named Kellylee Evans, whose CD is called Fight or Flight? Kellylee Evans was born in Toronto to immigrant parents from Jamaica. She did her first solo vocal performance in kindergarten, and was involved with singing throughout school, including performing with the Toronto Mendelssohn Youth Choir. But her academic pursuits were initially in a different direction. She attended Carleton University working toward a law degree. She also took night and summer classes to get second degree in English Literature. Her plan was to go for a PhD, like her father, but by then, playing in jazz groups in college, music tugged at her to where she dropped out halfway toward her master's and worked at music full-time. At that time, in 2002, she had almost died of an allergic reaction, and was still feeling the loss of her mother who had passed away before that. So she decided that she would focus on what she says was most important to her, her music. The experiences also inspired her to write songs, some autobiographical. Ms. Evans began to attract the attention of some more established musicians, and then in 2004 won second place in annual Thelonious Monk jazz competition, in the vocal category, whose judges included Quincy Jones and Al Jarreau. In 2005 she began work on a recording with bassist and producer Carlos Henderson and laid down two songs. Then, hooking up with jazz bassist Lonnie Plaxico, she went to New York and recorded the other 10 songs on her debut in the space of two days. The result is a pleasing and often fascinating recording that deftly evades category. She definitely has the delivery of a fine jazz singer -- her rich voice is relaxed but shows remarkable control and depth. The musical backing ranges from a kind of light rumba to folky to a bit of mainstream jazz to hints of airy funk. The music is all original, and her compositions are also first-rate. She is joined by a somewhat variable group that includes one set of personnel on the first two tracks which were recorded in 2004, including bassist Carlos Henderson, guitarist Carl Burnett and keyboard man Jon Cowherd; and different supporting musicians elsewhere, including bassist Lonnie Plaxico, keyboard man George Colligan, from Ravi Coltrane's band, guitarist Martin Sewell and drummer Steve Hass, among others. The sound is mainly acoustic, though there is one bluesy electric track. Each tune has some interesting stylistic element. The CD has a fair amount of Latin American influence, with some rumba and maybe a bit of tango. Her songs most deal mostly with love in one form or another, from being madly in love with someone to trying to cut off a relationship. 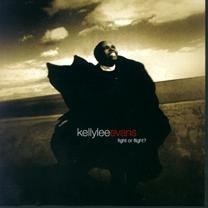 Kellylee Evans new CD Fight of Flight? is an impressive debut recording by another jazz-based singer who ventures into more eclectic material. And unlike most of the others, she is also a songwriter, having penned all the compositions on this CD. Her voice is virtually luminous, and for the most part, the stylistically diverse musical backing adds much to the CD and sets it apart from other chanteuse albums. It's all the more notable being that it's her first recording. Sonically, the CD gets about a B-plus grade from me. There is some heavy-handed volume compression to the point that there is a bit of distortion on Ms. Evans' vocal on some of the tracks, though the first two pieces, recorded at the earlier session in 2004 are better. The later session also lacks some of the intimacy of the early tracks. With no shortage of chanteuse style and jazz so-called "songbird" albums, it takes something to stand out. Kellylee Evans does that on her CD, emerging as a fully formed singer and songwriter of considerable talent and abilities. She has a bright future ahead of her.